Once she crosses the pond, she encounters something she never expected to see: dragons. It seems they might not be so extinct after all. In Shéa MacLeod’s electrifying follow-up to Kissed by Darkness, it turns out Morgan’s one chance of preventing certain carnage if the dragons are unleashed is to confront the truth about her own past, and about the darkness growing inside of her. 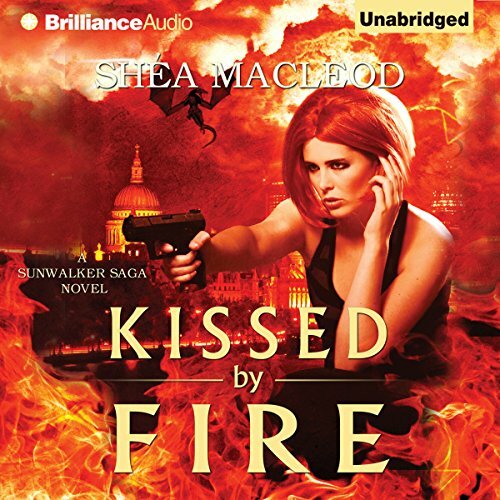 ©2012 Shéa MacLeod (P)2012 Brilliance Audio, Inc.
As far as UF goes, this series has been pretty weak. The heroine is a bit of a hot mess despite her ever growing super powers, the mythology is clugy at best, and the books are short on plot. I am not sure that I would say this book even has a complete plot. It sort of ties things up, but not really. Not to mention, that the tiny bit of resolution seems to come out of nowhere. Why should this surprise me? I mean, the mythology seems to constantly contradict itself. This power is inherited. Well, no its not, it is actually created. But, it is still kind of inherited after all. And, only dragons can do this one thing. Well, dragons, and demented, bigoted super villains. But it is okay, because soon Morgan will have every known special power in the universe. Thank goodness she doesn't have enough brain cells to rub together to make her a serious threat. this one did not make me want to stay up all night like some others, but it was a good story. A little predictable, but I still liked the story so much and wanted to see what would happen next to the main character that I got the next book in the series. So I would say I was not board and it was a credit well spent. Kissed by Fire starts off where Kissed by Darkness ended. I suggest readers listen to book 1 first. I like the characters: each with his or her own idiosyncrasies and personality. I like that the story is not predictable. Morgan continues to develop new talents. We learn more about both Morgan's and Kabita's interesting families. Morgan is obsessed with getting revenge on the vampire who killed her. After taking a truckload of weapons with her to England she sets out to hunt the vampire that killed her armed with only 1 knife. When she finally tracks him to his hiding place she finds a locked door in the catacombs blocking her from him. In a fit of anger she spontaneously sets the door on fire. Then instead of getting him she leaves. hated to stop last night just to sleep! this book leaves you wanting soo much more. More books, a lot more! Well written, lots of action and intrigue. Twists and turns keep you guessing right up to the end. The only thing I'm disappointed in is that they aren't in audio form from 4 on. I have to work 12 hours a day so the only reading I get is audiobooks. But after this next book I'll make time before bed for a special treat. Awesome creative series!! this book was well thought out with lots of action, magic and romance. "Morgan kept her fire burning all night long, a new ability it seems."